FACT CHECK: Did Vladimir Putin Rescue an Injured Donald Trump from the Viet Cong During the Vietnam War? An example of how no meme can be so over-the-top ridiculous that it won't at least prompt some questions. 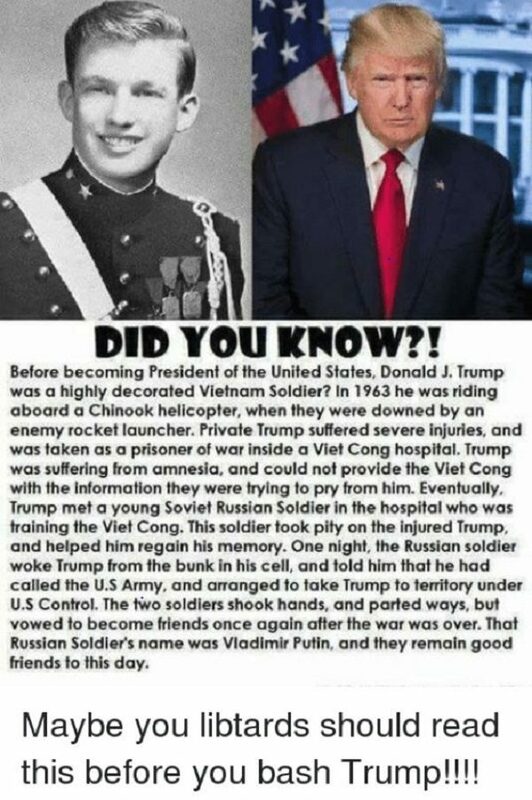 Donald Trump was wounded and taken prisoner by the Viet Cong in 1963, only to be rescued by Vladimir Putin. Every detail in the text of this image is wrong. It’s a well-known fact that President Trump did not serve in the military during the Vietnam War (or at any other time), as he received four student draft deferments while he was in college and a medical deferment for bone spurs in his heels after graduating. Furthermore, although the Soviet Union did support the Viet Cong militarily, Putin would have been too young to have taken part in that activity in 1963, when he was only 11 years old. Although the meme was certainly intended as a joke, it at least prompted some readers to question the veracity of its claims. The circumstances of Trump’s alleged capture as described in the meme are somewhat reminiscent of the story of Arizona senator John McCain, who as a Navy pilot was shot down over Hanoi in 1967 and was severely injured when he bailed out of his damaged bomber, then held prisoner for more than five years in North Vietnam. The New York Times. 1 August 2016. The New York Times. 27 March 2018. The New York Times. 14 April 1989. U.S. News and World Report. 28 January 2008.